In the part of the Vallespir around the pretty town of Céret in the South of France the climate and soil is particularly favourable for growing cherry trees and the town is surrounded by cherry orchards. 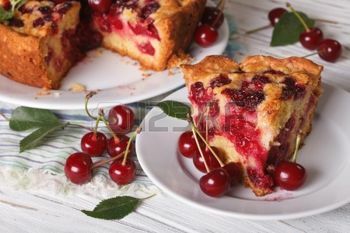 For more than 150 years the cherry has been a local favorite and provides gourmands – including the President of France – with the joy of tasting the first French cherries each year from mid-April. The tradition of sending the first cherries to the president started in 1932 as an advertising stunt to promote transporting the cherries by air. In May the town of Céret in the Pyrénées-orientales (Eastern Pyrenees) holds its famous Cherry Festival offering two days with many events centred around a large Cherry Market that brings together all the local producers and locals and tourists alike who just want to relax and enjoy the ambiance of the festivities celebrating everything cherry – including cherry beer, cherry wine, cherry burgers, cherry pie, cherry cake and of course cherry jam. The town is decorated on a cherry theme, including decorated windows, doors and shop displays. 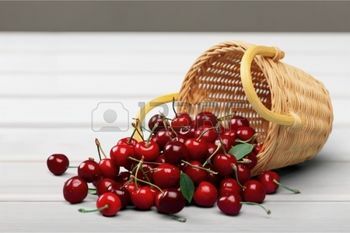 The events include tastings, contests to pit (or remove the stones from) cherries or spit the cherry stones. Menus in the many delightful restaurants in the town are cherry-themed. The Catalan city sees red and vibrates to the rhythms of bandas and Sardana (traditional Catalan folk dance) dancers. 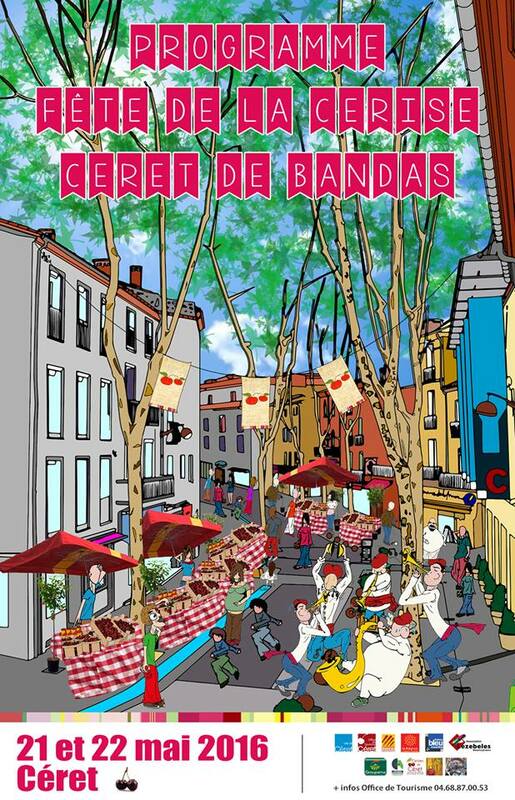 This year is the 23rd Céret Cherry and Bandas Festival and it takes place over the weekend of Saturday 21st and Sunday 22nd May, 2016. 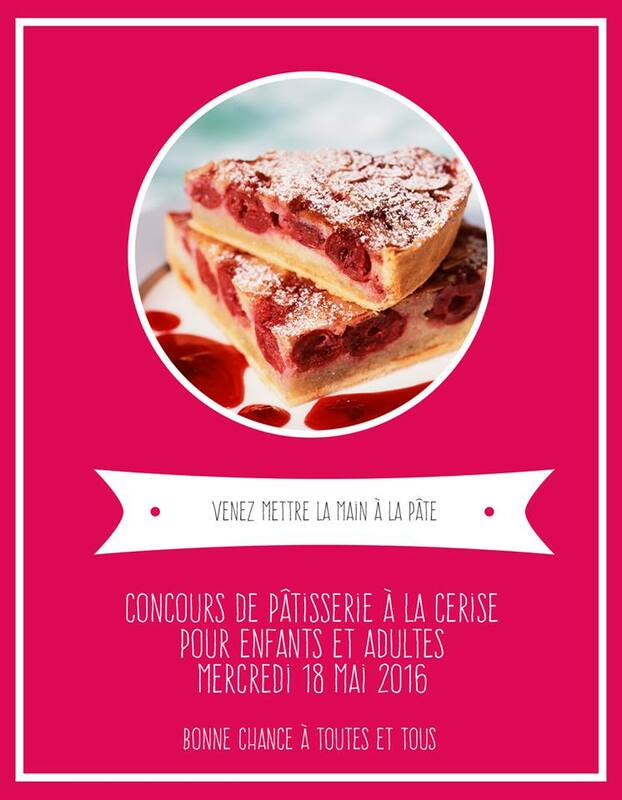 Before the main weekend events get underway there are some preliminaries: On Wednesday evening there is a pastry competition in the courtyard of the Town Hall, with prizes for the winners in both the adult and children’s competitions, and on both Thursday and Friday evenings there are also small producers markets. Aperitif with concert from the bandas in the place de la liberté, followed at 8pm by an open air meal there. On Sunday the farmers market for cherries, the local crafts and locally produced food again starts at 10am, with the bandas in the streets and pavement cafes. At 2.30pm another Catalan tradition of the Castellers are demonstrated on the boulevards. This is a uniquely Catalan tradition with the castellers forming very tall human towers. Sunday afternoon also sees another cherry spitting competition in the Place Picasso. The official closing of the festivities takes place at 5pm with sardanes, traditional Catalan dances, followed at 6 by the presentation of prizes for the pastry competition in the courtyard of the Town Hall. It’s a popular and fun weekend for everyone. Céret is a short drive (about 12 miles) from our villa, www.laroqueholidayvilla.com which makes a great base from which to explore the local area.